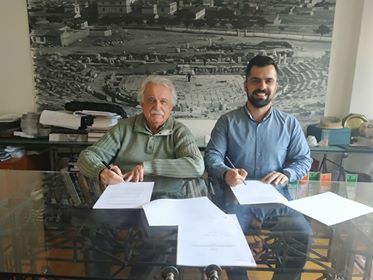 On Friday, 29 March 2019, the contract for the design and implementation of the website of the International Network of Ancient Theatres was signed at the offices of the DIAZOMA Association, by the President of the Diazoma Association Stavros Benos and the co-founder of the NPO Mataroa, Mr. Antonis Papadopoulos. The International Network of Ancient Theatres is an initiative of the Diazoma Association that aims to design a prototype and international model of cooperation, which will deal with the management, protection, and promotion of the ancient theatres in the wider geographic area of the Mediterranean basin. In June 2018, a Memorandum of Cooperation was signed between the Diazoma Association, the University of Venice IUAV, the Engramma Science Magazine and the University of Seville. The first step of this collaboration is the recording and constant scientific documentation of the ancient theatres of Greece, Italy, and Spain. To effectively dissemination this knowledge worldwide, it is necessary to develop an on-line platform that will host and display the scientific material collected. The objective of the above contract is, therefore, to assign the development of the website and secure the services required of the above- mentioned program. The website should be user-friendly, a web-based repository of scientific material, and accessible to its visitors in an attractive and simple way. The time required for the development and preparation of the website is 6 months. During this time, the following will have been implemented: a) the network for the Ancient Theatre’s Website, b) the Network logo and its applications, and c) the website management guidelines. The cost of the assignment is 2.400,00 Euro, including VAT, and will be paid by the Paul & Alexandra Canellopoulos Foundation as a Cultural Sponsorship to the DIAZOMA Association. We thank the Paul & Alexandra Canellopoulos Foundation for their full support, which has paved the way for a very important program that will contribute to the promotion and care of the ancient theatres of the Mediterranean!